THE JUNGLE BOOK. The last few years have made me almost as wary of children's movies as I am of remakes. Both seem increasingly crass: uninspired excuses to cash in on younger moviegoers' short memories and shorter-lived sense of joy and wonder. I can still recall the feeling I got from a great movie experience when I was little, even as the ravages of time and chemicals render those feelings as faint echoes of once symphonic outbursts. So it pains me a little to watch contemporary kid's movies that are empty of real feeling, dedicated instead to conspicuous consumption, the creation of digital worlds that, while often gorgeous, just as often feel hollow and antiseptic. It strikes me that kids today are being forced to settle for less-than-wonder at the movies, and that pains me. Then again, each day I draw one step closer to the reliquary and my protestations sound ever more like those of a bitter old man. Let the children enjoy their afternoon; I just think they deserve better. 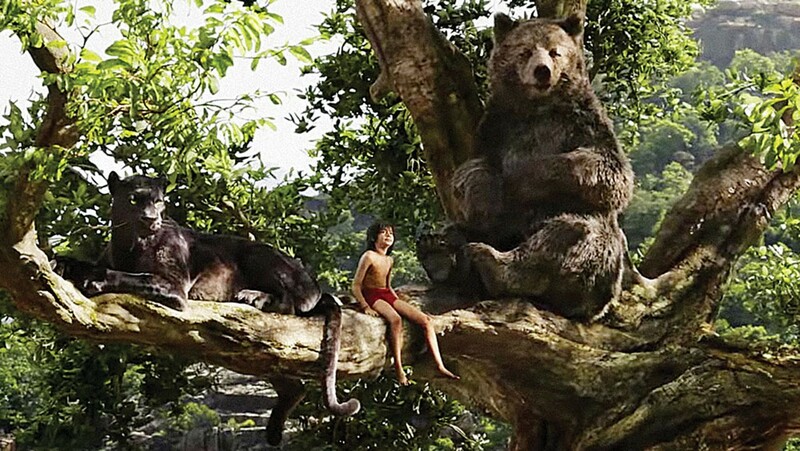 And with Disney and director Jon Favreau's (Chef, Made, Zathura) version of The Jungle Book, they shall have it. Nearly 50 years have elapsed since the release of the original animated version of this story (before even my time), but some of its elements must have filtered down to subsequent generations. Disney re-released the movie at least once in my childhood, so The Bare Necessities is on the soundtrack of my youth. Time enough has passed, though, that a remake, particularly one that (finally) makes constructive use of the dazzling technology available now, feels more like a tribute than a greedy betrayal. The man-cub Mowgli (newcomer Neel Sethi) is found alone in the jungle as an infant by the kindly panther Bagheera (Ben Kingsley). Bagheera entrusts him to the care of Raksha the wolf (Lupita Nyong'o), who raises him as part of her pack. 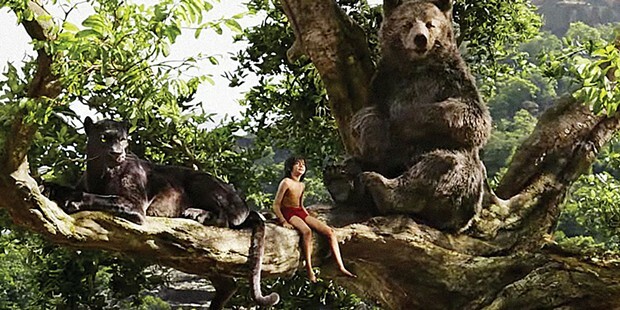 Years pass in peace and harmony, despite Mowgli's occasional struggles to keep up and fit in with his lupine siblings. When a drought forces a truce among all the species of the jungle, though, it draws scarred, hateful tiger Shere Khan (Idris Elba) down from his hunting grounds and into conflict with, well, everybody. Upon learning that the wolves harbor him, Shere Khan will stop at nothing to kill Mowgli in revenge for a long-ago injury at the hands of a man. So Mowgli takes it upon himself to leave, thereby removing the threat to his family's safety. Too little, too late though: As Bagheera leads the boy toward the village of men, Shere Khan terrorizes the wolf-pack and sets out after his quarry. Along the way, Mowgli falls in with the bear Baloo (Bill Murray), has a trippy exchange with the serpent Kaa (Scarlett Johansson) and butts heads with the formidable King Louie (Christopher Walken), all the while learning about identity, individuality and community. The jungle fascinates, intrigues and (thanks to watching Predator and Apocalypse Now at impressionable ages) horrifies me. And Favreau's vision of it, completely digital, save Sethi's live performance, is the first evocation immersive enough to bring me back to the wonder of childhood. To my eye, this is the best application of contemporary imaging technology so far. (A brash claim, I know, but I'll stand by it). The effects are seamless, the animal characters true to life and the cumulative effect is of grand adventure. The movie refuses to talk over children's heads, or wink at the parents in the audience. Instead, it uses beautiful imagery to shore up an already strong story — you know, like great cinema. PG. 106m. BROADWAY, FORTUNA, MILL CREEK. HELLO, MY NAME IS DORIS. Sally Field plays an office worker who gets her second wind pursuing a young man. R. 95m. BROADWAY, MILL CREEK. HUNTSMAN: WINTER'S WAR. Like a scary, couture Frozen, with Liam Hemsworth as the fairytale hero embroiled in sister drama. Starring Charlize Theron and Emily Blunt as good and evil queens. PG13. 114m. BROADWAY, FORTUNA, MILL CREEK. 10 CLOVERFIELD LANE. This tight, paranoid, claustrophobic thriller of a monster movie is well-acted, compelling and enjoyable from first frame to last. Starring Mary Elizabeth Winstead and John Goodman. PG13. 105m. BROADWAY. BARBERSHOP: THE NEXT CUT. Ice Cube returns as Calvin, trying to save his shop and his neighborhood with the world's chattiest employees. With Cedric the Entertainer and Eve. PG13. 112m. BROADWAY, MILL CREEK. BATMAN V. SUPERMAN: DAWN OF JUSTICE. Ben Affleck is surprisingly solid as the new Batman, but neither he nor Henry Cavill's sturdy jaw can save this high-production cacophony of collapsing buildings, baffling dream sequences, congressional hearings and rushed exposition. PG-13. 151m. BROADWAY, FORTUNA. THE BOSS. Riches-to-rags-to-riches isn't new, but Melissa McCarthy, as a fallen CEO making a bakesale comeback, sweetens the deal with cutting asides and hilarious dialogue. With Peter Dinklage as her business-bushido ex. R. 99m. BROADWAY FORTUNA, MILL CREEK. CRIMINAL. The memories of a CIA spook (Ryan Reynolds) are dumped into the brain of an ex-con (Kevin Costner), who must now finish off a bad guy and save the world. R. 113m. BROADWAY. DEADPOOL. A bloody, clever, distinctly adult Marvel vehicle for Ryan Reynolds' weird charisma. A fun break from the steady flow of grim comic adaptations. R. 108m. BROADWAY. EYE IN THE SKY. A remote operation gets morally, tactically and politically tricky when a child wanders into the line of fire. Don't worry: Helen Mirren is handling it. R. 102m. BROADWAY, MILL CREEK. MIRACLES FROM HEAVEN. Jennifer Garner stars as a woman on a mission for her ill daughter, whose recovery stumps doctors. PG. 109m. BROADWAY. ZOOTOPIA. An animated animal take on the odd-couple buddy movie with Jason Bateman, Ginnifer Goodwin and Idris Elba. PG. 108m. BROADWAY, MILL CREEK.